The motion picture industry holds a powerful influence on modern society. It helps to create and present images including those of Asians and Asian Americans in the United States. The American public is exposed to various characters but also stereotypes through the creative minds of the directors, writers and actors. Due to the current migration of Hong Kong action cinema, perceptions of Asian Americans have undergone a vast change. The two most influential people in this Asian "invasion" are director John Woo and actor Chow Yun Fat. Woo began as an apprentice at the Shaw Brother Studios' in Canton before being promoted to assistant director in the early 1970s.3 He was then known for his ability to intricately stage action material, particularly in humorous situations. 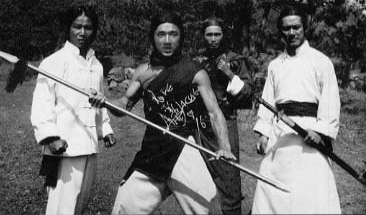 In 1973, he became a full-fledged movie director and made his first movie, The Young Dragons. Then in 1976 he directed the superior Golden Harvest "chop socky" "Hand of Death", starring a young Jackie Chan. During the early course of his career, Woo did not move from film to film trying to achieve instant monetary success. By researching thrillers such as Melville's Le Samourai and Clouzot's The Wage of Fear, he began to set the ground work for his three greatest Hong Kong films: A Better Tomorrow, The Killer, and Hard-Boiled. John Woo establishes his own personal filmmaking with these three films. There are themes of chivalry and honor in the modern world. In A Better Tomorrow, it was honor among brothers. In The Killer, it was honor among assassins. In Hard-Boiled it was honor among men. In the three films, the main conflict was create by the platonic relationship between two men. This relationship is John Woo's signature theme. These characters in Woo's films are presented with complex moral choices. In a sense, these characters are tested, floating from the gray areas of what is right and what is wrong. Cinematically John Woo pioneered a new visceral style of action cinema. Multiple cameras shooting all simultaneously, free frames, slow motion. These techniques along with meticulously choreographed action sequences, created a heart-pounding, edge of the seat action. Woo's liberal use of bullets and gunplay is offensive to many, but in his world, guns never need to be reloaded. When viewing Woo's movies, the violence seems excessive and gratuitous. Violence is an abstract expression in his films, a vehicle used to show the ballet-like qualities of his dream world. The characters in John Woo's films are his modern day version of knights engaged in battle, with guns for replacements for swords. 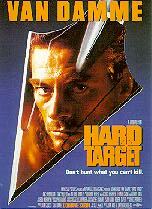 Hard Target was a good entry film for John Woo. He was, in essence, testing his ability to translate his particular style of directing to Hollywood. The end product was a decent action film, mainly powered by Woo's signature action scenes and the film's most intriguing characters, the villains. It was these elements that managed to make Hard Target succeed, even though hampered by the less than stellar acting by the "thespian" Van Damme. Now Woo had a good grasp of Hollywood and everyone was waiting for his next production. John Woo's second U.S. film was Broken Arrow. It featured American stars John Travolta and Christian Slater. The plot revolves around the theft of a nuclear missile by Travolta's character Deakins. Deakins steals the warhead into order to extort the U.S. government. The only man in his way is co-pilot Hale, played by Slater. Deakins leads Hale on a fast paced chase around the U.S. southwest. Face Off (Fig. 6) is John Woo's most recent film. FBI agent Sean Archer goes undercover to get information about a possible bomb that is going to level Los Angeles. Archer has to assume the identity of his nemesis Castor Troy, through a surgical process. However, Troy recovers and then takes the identity of Archer. This mix up results in complete reversal of situations for the two men. With these six films, three from Hong Kong and three from the U.S., John Woo established his unique filmmaking style. 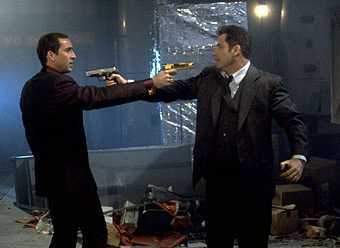 The key elements that exemplify his style are highly choreographed shoot out scenes. Once again many signature John Woo trademarks seen in his Hong Kong films were seen on the American screens. Twin automatic shoot-outs, such as in Hard Target. Tense standoffs in Face Off. High speed pacing of action in Broken Arrow. With large production budgets and the availability of high tech effects not found in Hong Kong film, Woo's Hollywood films are much more explosive and exciting. John Woo has made a great impact on the image of Asians and Asian Americans. Through the powerful medium of motion pictures, he is able to demonstrate that an Asian man can excel in an industry that is essentially an American product. Woo's unique style of directing transcends all boundaries, making him not only a great Asian director but one of the greatest directors of all time. This "Hollywood Clout" enables John Woo to absolute creative control of his projects. Therefore, he is better able to present a more authentic characterization of Asians on the screen. This authentic portrayal will be realized in Hollywood when Woo once again collaborates with his favorite actor, Chow Yun Fat. Chow Yun Fat emerged in Hollywood with his first American film, The Replacement Killers. He plays hitman John Lee. Lee owns a debt to the powerful drug lord, Mr. Wei. When Lee can't pull the trigger on an assignment to kill a child, Wei sends in the replacement killers to finish the job. Facing the reality that Wei will harm his family in China, Lee seeks out a paper forger to help get a false passport. Then Lee must confront Wei himself. The Replacement Killers, direct by American Antoine Fuqua and produced by long time collaborator John Woo, showcased Chow Yun Fat's ability in action films. 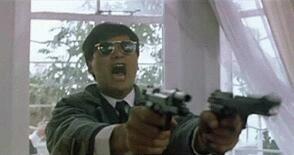 Many of the action shoot out sequences harked back to the "golden days" of the John Woo's Hong Kong days. High on style and image and low on character development, The Replacement Killers, gave many Americans their first taste of Hong Kong style or John Woo style action. Chow Yun Fat's charismatic portrayal of Nick Chen saves The Corruptor from being a total failure. The Corruptor is burdened with demeaning Asian stereotypes of gangsters, prostitutes, bedraggled illegal immigrants. Chow Yun Fat brought to life a character who was the exact opposite of the character he played in The Replacement Killers. Nick Chen was not the super cool, super suave hitman, he was a charismatic multi-faceted character faced with moral issues. Chow Yun Fat brings a positive Asian image to the motion picture screens. His dynamic screen presence in such films such as The Corruptor help to redefine the modern Asian image. The characters that Chow Yun Fat portrays are not the typical Hollywood stereotype of the "Yellow Peril". Instead, he is a member of the most elite group of actors, leading men. He is able to carry films on the basis of his acting ability and magnetic persona. Chow Yun Fat proves that Asians are capable of being truly gifted actors. There is no doubt that John Woo and Chow Yun Fat are two most influential Asians in the motion picture industry. The body of work by these two men more than exemplifies their talent and drive. Now with the migration of John Woo and Chow Yun Fat to Hollywood in the recent years, the a new image of Asians will be brought forth. Ever since the beginning of the motion picture industry Asians and Asian Americans have been waiting for "A Better Tomorrow", a day when talents Asians are portrayed with respect and dignity. Now with of the introduction of director John Woo and actor Chow Yun Fat, the wait is over. "Tomorrow" is today.